The mortgage is like an assembly line in that it’s labor divided among individuals with specialized skills, and when they complete their tasks, they pass it on down the line to the next person. The assembly line model works for products that are produced en masse — duplicates of each other with interchangeable parts, but mortgage loans are individualized. The mortgage industry needs a new model to fix the supply chain and support its collaborative nature and need for customizable care. The mortgage industry is like an assembly line. Labor is divided among individuals with specialized skill sets who complete their specific tasks on the product and send it down the line to the next person. The mortgage process requires multiple levels of communication between participants. The lender, settlement agent, real estate agent and homebuyer are key players who need to exchange and collaborate on significant financial documents and data. But the assembly line does not facilitate interaction between persons and certainly not between companies. Its entire structure is built on siloed tasks that rely on each taskmaster to amplify production and increase speed. But if one individual is waiting on information from others, bottlenecks are created and production is delayed. The assembly line model works for products that are produced en masse — duplicates of each other with interchangeable parts. But each mortgage loan is unique because each one is based on data from different people. Both the buyer and seller need customizable care to fit their situations. Any number of deviations from an assembly line process can occur while originating a mortgage. Differences including liens on the property, inconsistent or difficult-to-verify employment history, unique property types, divorce decrees or powers of attorney — to mention a few. Anyone who works in the industry understands that even though a loan should be simple, quirks will usually surface. 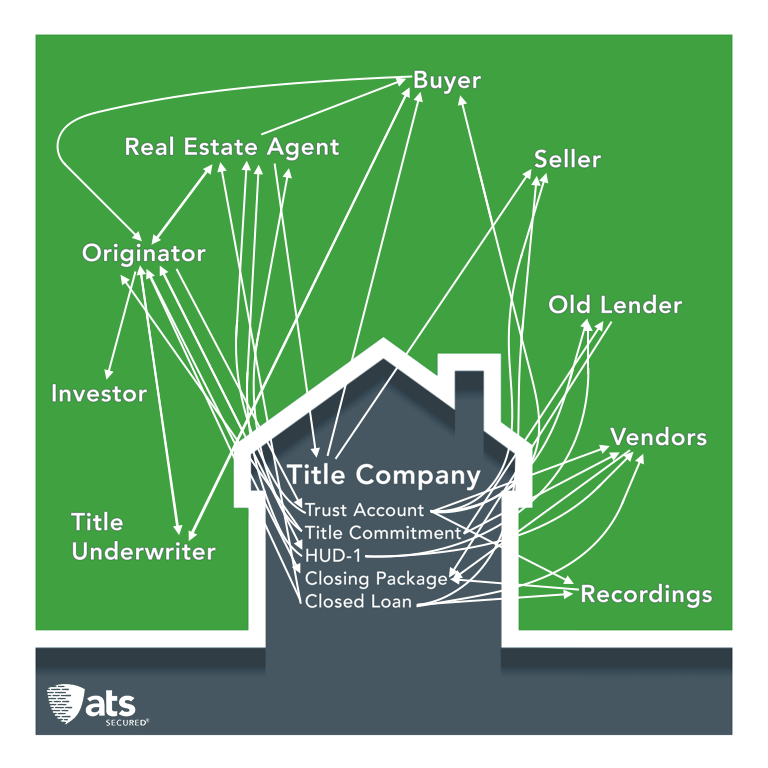 Because of the way the mortgage industry is set up, the main contributors to a loan (the lender, settlement agent, real estate agent, vendors) all use different systems but often need the same documents or data (loan estimates, purchase contracts, title commitments, consumer data, etc.). In other words, each loan has several assembly lines. This complicates communication and muddies information needed to close a loan. The typical mortgage process is redundant, many times over. “So if you’re entering it 80 times, is there any chance you could be wrong once or twice? It’s pretty stupid, the way we do it,” Stone said. And he’s right – it is stupid. Redundancies increase the error rate exponentially. Typically, errors, if uncovered at all, are not discovered until late in the process, creating bottlenecks and delays. If someone in the supply chain has information they don’t think is important and, therefore, don’t share — there can be significant ramifications down the assembly line. You might think that’s not a supply chain issue, that it’s a training issue. But this is just one example of the general lack of knowledge about the mortgage process. With so many rules, policies and procedures in place, it’s difficult to know the intricacies of what everyone else needs down the line, and the smallest discrepancy can create significant negative impacts for others. It’s like the butterfly effect: One misplaced word or number can change the loan completely. To do really well in the mortgage industry, one has to have a vision of the whole. This level of knowledge is almost impossible on an assembly line. In fact, training on the whole process is deemed unnecessary. Assembly line workers have no need to understand what the end product needs to look like. They need focus only on their small task and ensure that they perfect it. This model does not work for the mortgage industry, mainly because the big picture doesn’t end at the closing table — it continues into the secondary market. Mortgage origination relies on the secondary mortgage market. Without mortgage investors, lender liquidity would quickly dry up. Lenders need to sell loans to write new loans, and investors want as little liability as possible on a purchased loan. Investors need assurances that the i’s are dotted and the t’s are crossed. They might use reps and warrants in their contracts to force lenders to repurchase loans that are not performing and use supply-chain mistakes as justification. To be successful in this industry in the future, all key stakeholders in the origination process must recognize how their actions affect the secondary market and loan securitization. The federal Consumer Financial Protection Bureau and other regulators are looking beyond what is on paper. They are investigating the reasons and intentions behind companies’ actions and inactions. The CFPB is also trying to help consumers become more aware of pitfalls that can occur, whether deceitfully or by accident, during the mortgage process. These changes are making transparency paramount in mortgage banking and real estate transactions. However, the assembly line model does not support transparency, as has been illustrated above. Tunnel vision, lack of collaboration, bottlenecks or delays, redundancies, a lack of customizable care and delayed updates do not foster the ability “to see clearly, to understand readily, have the characteristic of easy access to information and being free from the pretense of deceit” — the definition of transparency. The mortgage industry doesn’t need a faster assembly line. It needs a new model to fix the supply chain and support its collaborative nature and need for customizable care. A process that eliminates redundancies, bottlenecks and delays. A system that empowers people with real-time information, a clear view of the big picture and transparency. The mortgage industry doesn’t need a faster assembly line — it needs a new model. Wes Miller is the CEO and co-founder of ATS Secured, a new technology category for the real estate closing industry. Are your advertising agreements setting off red flags at the CFPB?